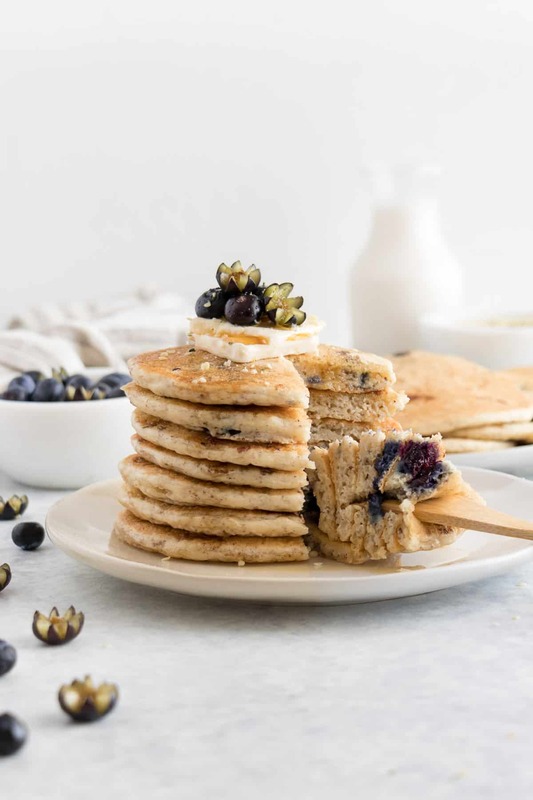 These vegan blueberry pancakes are a delicious breakfast treat! Enjoy this light and fluffy pancake stack with warm maple syrup on top. 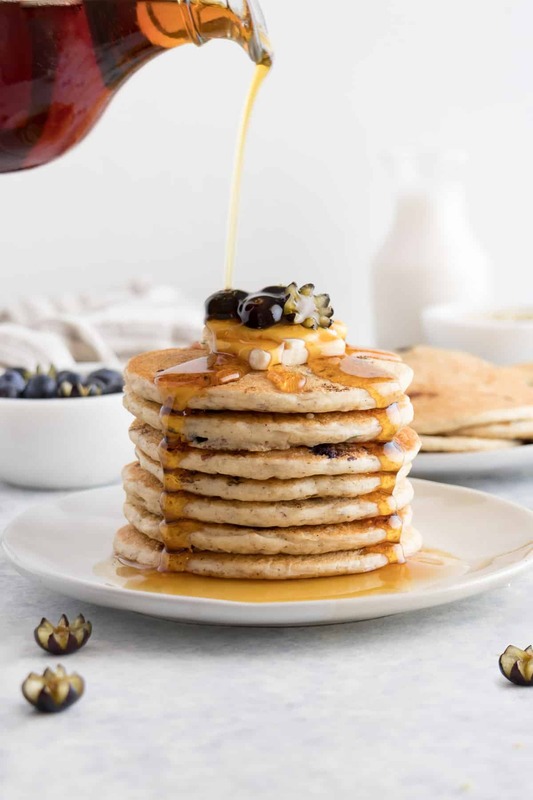 There’s nothing like starting your day off with a stack of fluffy vegan pancakes, am I right? 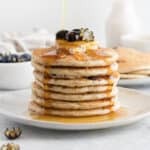 And it’s even better when the pancake stack is topped with warm maple syrup, a slice of vegan butter, and fresh blueberries. This recipe is pretty much my go-to weekend brunch! First, create the flax egg (see below for flax egg instructions). Second, combine the dry ingredients. This includes flour, sugar, baking powder, and salt. Next, toss in the wet ingredients. This includes almond milk, blueberries, vanilla, and the flax egg. Then, spoon the batter onto a warm skillet to cook. Finally, top the pancakes with maple syrup, vegan butter, and fresh blueberries. Combine 1 tbsp flaxseed meal + 2 tbsp water. Stir together and set aside for 5 minutes. Voila! You have created a flax egg. The main purpose of a flax egg is to bind ingredients together, much like a traditional egg would do. But that’s not the only benefit! 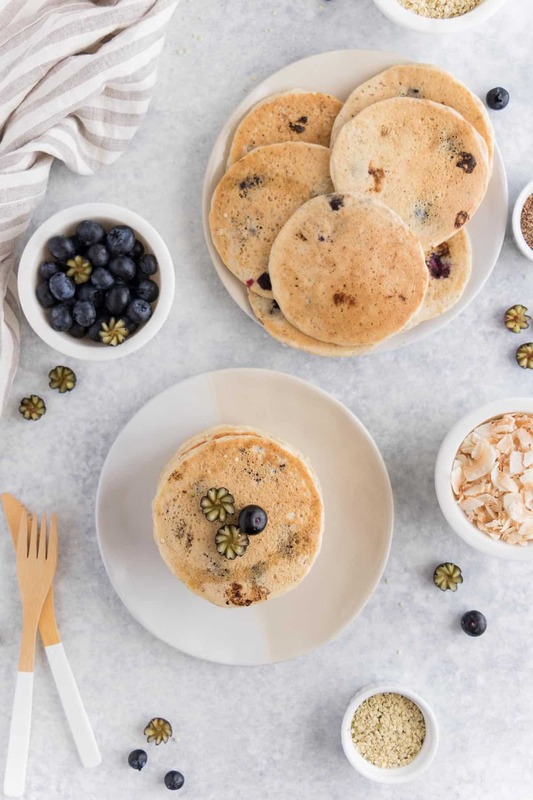 Flax seeds are loaded with nutrients, adding a boost of vitamins and minerals to these pancakes. Do not over-mix the pancake batter. To achieve fluffy pancakes, mix the ingredients until just combined. Still have lumps and air pockets in the batter? That’s totally ok. In fact, it’s preferred! If you don’t have coconut sugar on hand, you can use regular cane sugar instead. Pay attention while the pancakes are cooking! The best time to flip each pancake is when air bubbles begin to form on their surface. Follow this rule and you’ll always achieve golden-brown pancakes. Add any toppings of your choosing. But, personally, I think maple syrup is a must! 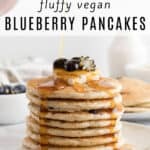 If you like this vegan blueberry pancake recipe, you may also enjoy these vegan banana pancakes! 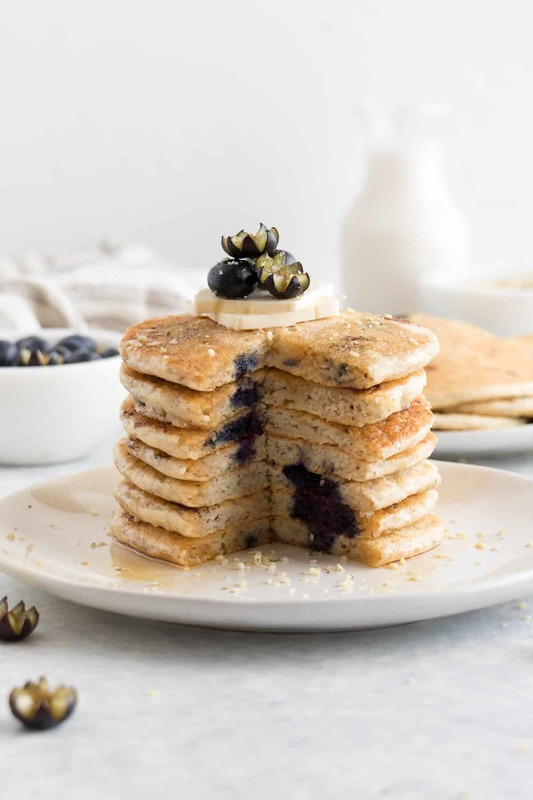 These vegan blueberry pancakes are light, fluffy, and SO delicious! 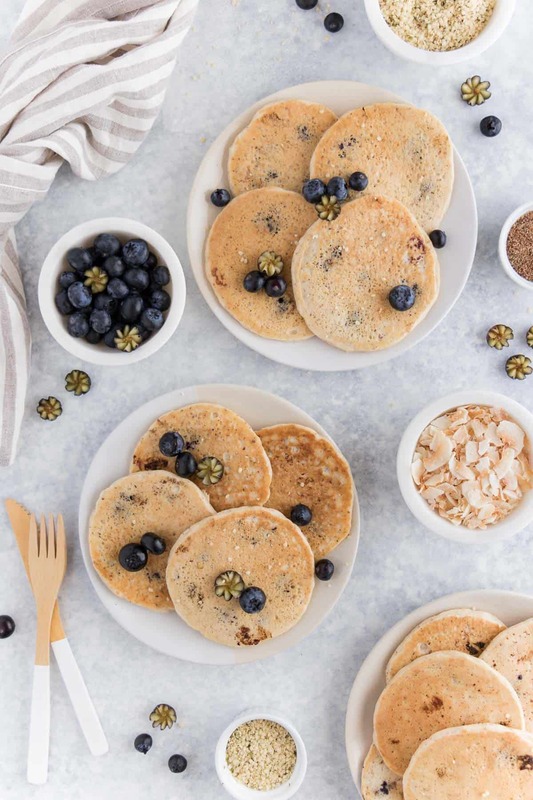 Enjoy this pancake recipe with maple syrup, vegan butter, and fresh blueberries. Create the flax egg by combining 1 tbsp flaxseed meal + 2 tbsp water. Stir together, and then set aside for 5 minutes. Mix the dry ingredients in a large bowl. Then, add in the flax egg + all wet ingredients. Stir until just combined. Heat a skillet on medium temperature. Grease the skillet with oil or non-stick spray. Spoon the pancake batter onto the skillet. Once bubbles begin to form on the surface of each pancake, flip to cook the other side. Serve with maple syrup and any toppings of your choosing. Store any leftover pancakes in the refrigerator within an airtight container. Reheat on a skillet before consuming.